ST. GEORGE — The Dixie Lady Flyers outlasted Hurricane Thursday night, hanging on to win their Region 9 girls basketball contest by a single point, 29-28. Hurricane managed to hold Dixie without a field goal the last five minutes of the fourth quarter, but failed to capitalize on its own scoring opportunities down the stretch. 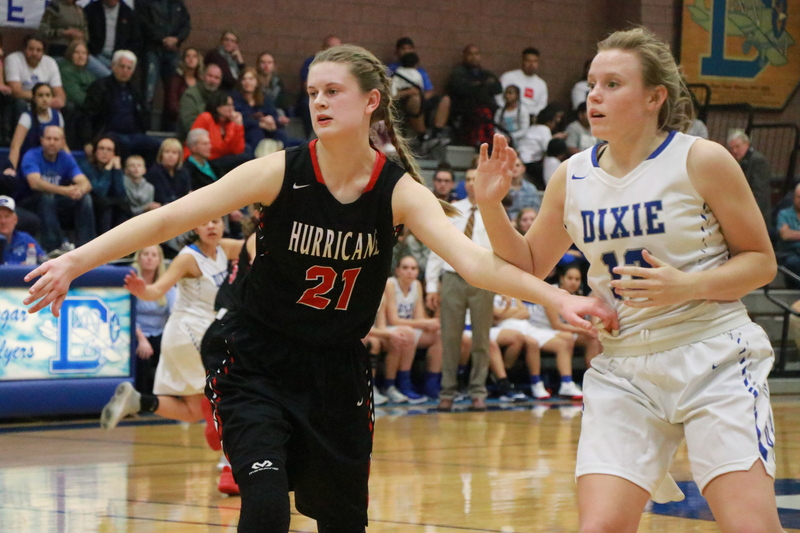 Hurricane senior Alexa Christensen’s potential game-winning shot fell short in the final seconds, allowing Dixie to escape with the home victory. It was the Lady Tigers’ third region defeat in as many games, with the three losses coming by a total of four points. Hurricane lost to Canyon View 51-50 on Dec. 19 and to Pine View 42-40 on Jan. 9. Dixie, meanwhile, improved its region record to 2-1 with its second victory this week. The game was a defensive battle, with both teams shooting poorly from the field and from the free throw line. Defensive pressure also forced numerous miscues on both ends of the floor, with Dixie turning the ball over 23 times and Hurricane committing 18 turnovers. Both teams also struggled at the free throw line. Dixie converted 8 of 22 free throws during the game (36 percent), while Hurricane made 3 of 7 free throws (42 percent). The score stayed close the whole way, with Hurricane leading 8-7 after one quarter and Dixie leading 16-15 at the half. The lead changed hands multiple times during the third quarter, which ended with Dixie ahead 23-21. Notably, the Lady Flyers missed nine free throws in the fourth quarter alone, including going 0 for 5 in the final minute. Hurricane last led 25-24 after a steal and a layup by Jayden Langford with six minutes left in the fourth quarter. From that point, Hurricane’s only field goal was a putback by Hailey Homer with 1:10 remaining to bring the Lady Tigers within one, 29-28. Neither team scored again, with each team missing its last few shots. “We were really fortunate to come away with the win tonight,” Dixie head coach Ryan Forsey said. “Hurricane is a well-coached team and I think they may have been a little fatigued from a tough loss to Pine View earlier in the week. Junior center Sina Tapasa led the Lady Flyers with 13 points and nine rebounds, while sophomore guard Joslyn Bundy added six points. Hurricane was paced by Langford’s nine points, while Christensen contributed eight and junior forward Hailey Homer added seven. 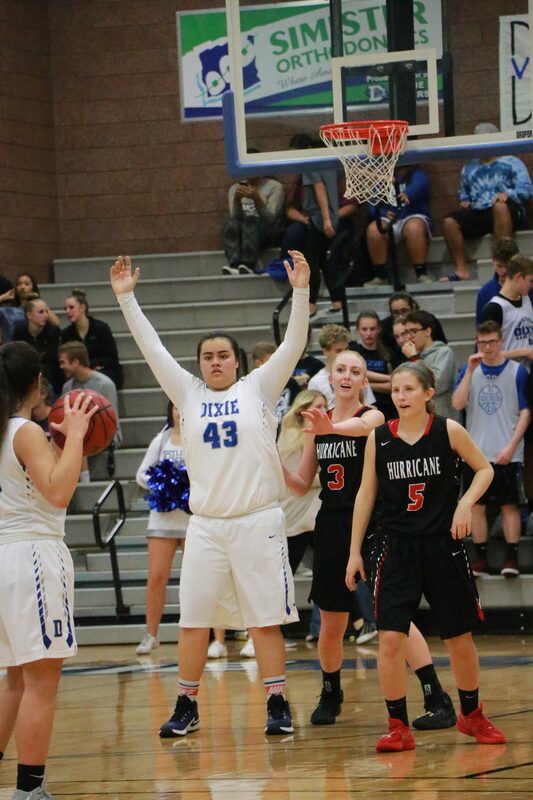 Dixie next plays at Snow Canyon on Tuesday, Jan. 16, while Hurricane will host Desert Hills that same evening. In other Region 9 girls basketball action Thursday, the Snow Canyon Lady Warriors jumped out to an early lead against the visiting Canyon View Lady Falcons and cruised to a 59-32 victory. “We had a great bounce-back game tonight after a tough loss on Tuesday,” said Snow Canyon head coach Ryan Rarick. “Canyon View is a very scrappy team that fought until the end and made our girls work for everything. Snow Canyon led 29-8 at intermission. “Canyon View fought hard in the second half and made the game very physical, but it was good for our girls to have to answer that physicality and still execute our plan,” Rarick said. “It was a rough first half, but a better second half,” said Canyon View head coach Jaycee Slack-Barnhurst. Mel Kata led the way for Snow Canyon with 12 points, while Tylei Jensen scored 11, Rachel Durante had 9, and Sammi Johnston scored 7. Snow Canyon (2-2 in region) next hosts Dixie Tuesday, Jan. 16, while Canyon View (now 1-3 in region play) next plays at Pine View Thursday, Jan. 18.